SEDL works directly with educators to build their knowledge and instructional skills in core content areas, such as science and mathematics. We don’t stop there, either. We also guide educators in using technology to promote learning and 21st century skills. “This mudslide looks horrible. Kids will love it!” A group of teachers gathers around a computer. They are choosing images for a video on the concept of change—rapid change, like natural disasters, and slow change, like erosion. The activity is part of SEDL’s Connecting Kids to Math and Science program. 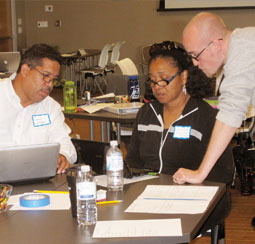 This 2-year pilot program, which began in 2010, involves intensive professional development to hone teachers’ instructional skills and technology use. The goal is to help students excel at—and enjoy—math and science. Some 40 fourth through eighth grade teachers are taking part, reaching more than 800 students in six schools in Austin, Texas. The schools all serve high-need student populations. Grades 4–8 are the focus as many students, especially low-income and female students, begin losing interest in these subjects or confidence in their ability to master them during these grade levels. The Connecting Kids program presents project- and inquiry-based strategies to engage students, build their confidence, and boost achievement. Teachers also explore strategies to integrate math and science, deepen students’ critical thinking skills, and incorporate technology. As follow-up, staff are visiting classrooms to observe teachers in action and provide support. After the program, we will post the materials online to share nationwide. The program is funded through grants from the Educational Foundation of America and the KDK-Harman Foundation. Improving math and science education has become a national priority to ensure a strong workforce for fields like clean energy and biomedicine. Through the Connecting Kids program, SEDL is helping students gain the skills, confidence, and desire to pursue math and science careers. For more information, please contact Danny Martinez, SEDL program associate at 512-391-6533 or via email at danny.martinez@sedl.org.